Discussion in 'General Science & Technology' started by paddoboy, Feb 9, 2017. (Phys.org)—Researchers have developed a type of rechargeable battery called a flow cell that can be recharged with a water-based solution containing dissolved carbon dioxide (CO2)emitted from fossil fuel power plants. The device works by taking advantage of the CO2 concentration difference between CO2 emissions and ambient air, which can ultimately be used to generate electricity. The CO2 concentration difference between ambient air and exhaust gases created by combusting fossil fuels is an untapped energy source for producing electricity. One method of capturing this energy is dissolving CO2 gas into water and then converting the produced chemical potential energy into electrical power using an electrochemical system. Previous efforts using this method found that electricity can be generated; however, electrical power densities were low, and expensive ion-exchange membranes were needed. Here, we overcame these challenges by developing a new approach to capture electrical power from CO2 dissolved in water, the pH-gradient flow cell. In this approach, two identical supercapacitive manganese oxide electrodes were separated by a nonselective membrane and exposed to an aqueous buffer solution sparged with either CO2 gas or air. 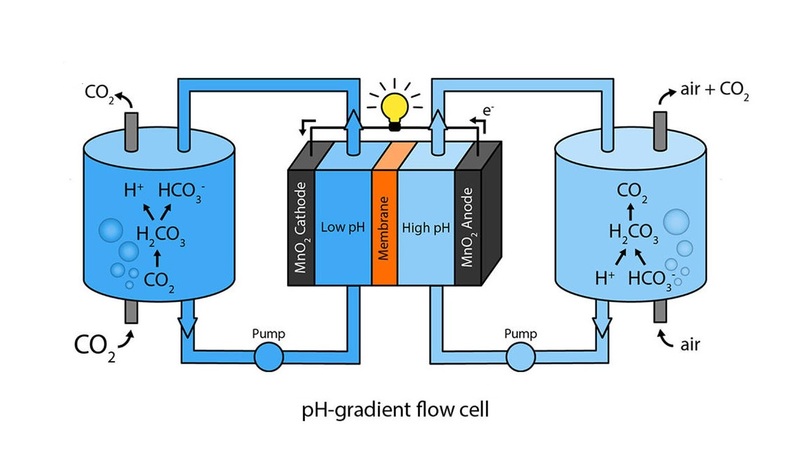 This pH-gradient flow cell produced an average power density of 0.82 W/m2, which was nearly 200 times higher than values reported using previous approaches.